First, an apology to myself and any readers that might possible be out there. Last week I hit a wall. First there was a migration surge at work as I realized how very close I was to completing the remaining spring semester courses that needed to be migrated into the new system and tweaked. I worked toward my goal set in July of finishing those courses by the holiday next week and there I was finishing early! However, by Thursday, I was feeling punky and Friday necessitated a sick day with 20 some hours of sleep. These two events definitely put me behind in my coursework last week. In fact, I did almost nothing to participate in the course. So, as I'm now caught up at work and at home, I'm resolved to catch up in this course. I have a feeling that these two subjects are more or less related even before I get to the postings and videos. The other day I drove by a local elementary school advertising "McTeacher Night". McTeacher Night? What is the heck that, some kind of mass produced, fast food robitron wearing a baseball cap emblazoned with golden arches teaching kids to flip hamburgers and fry potatoes? It turns out it's a fund raising event whereby the teachers, students, and parents of a school converge on a local McDonald's for one evening and a part of the proceeds for the evening are (presumably) given back to the school. I don't know about you, but I find this idea appalling, not only because I hate McDonald's (and most fast food companies) for the damage they've done to our environment and our health, but also because this corporation will now have some kind of message, however subtle, to parents and children that it "supports" education. Let's not forget that this money came directly from the pockets of the parents, teachers and students themselves and that the pockets of ole Ronald McDonald himself are duly filled as well. It's all win, win, right? Wrong. How is it that we accept corporate sponsorship of education so freely? We even introduce our children into it when they are too young to realize that they are being "branded" for life. I'm probably being too alarmist when I say that, by giving money back to the schools to fund projects that the schools themselves should be funding, McDonald's will own these kids for the rest of their lives. McDonald's as the good guys, right? Uh-huh. The idea of corporate interference with knowledge - both its creation and its transference - just bothers the heck out of me. For years, corporate "America" has been ingratiating itself into the classroom with it's funding and brand names. More and more our government, who is supposed to supply its population with an education so that it can think and therefore, vote with intelligence, withdraws educational funding forcing schools at every level to rely on private (corporate) contributions and forcing our children to become fundraisers instead of students. I smell a corporate rat here! Ignorant little fundraisers growing up to be ignorant corporate cronies. How can we get corporations out of our schools and the business of education? Part of the problem is that we see education as a business with knowledge the commodity sold to "clients" (students) hawked by providers (instructors). Many no longer see knowledge as an end in itself, but as a product that can be bought. Thus, we see students who believe they are entitled to an "A" because they paid for the class even if they did not learn one thing. Another part is that our schools, being underfunded, have to fill that gap somehow. Parents (taxpayers) will only tolerate so much in increased taxes, so here come corporate America to the rescue - as long as you prominently display their logo. Reading Higher Education, Globalisation, and the Knowledge Economy (M. Peters, 2007) only reinforced some of ideas about "systemic change within education gone bad" that I have been harboring for a while. As our higher educational system moves from the purveyors of reason and culture to that of purveyors of "excellence", we are less concerned about the acquisition of new knowledge for its own sake, then with knowledge as it applies to ::fill in the blank:: objective. If it can't be measured, it ain't knowledge or at least it ain't worth knowing. Hmmmmm. Peters hits the nail on the head when we calls the modern day university president's job a "bureaucratic administrator", an "executive." Our presidents and chancellors are disengaged from the day to day dealings of the college because they must spend time doing their own fund raising. Fund raising from the government legislatures who want progress typed into little boxes in black ink before they give out their stingy cash streams. They want results and they want them now! Measure every idea going into a student's head and then measure it coming back out again. See how much money's been lost? Sorry, go to the end of the line. Does anyone else feel as though they are holding on to the sinking Titanic? Both Seimens' and Peter's articles foretell the end of education as we know it by "gutting" classrooms and other bounded spaces. The view from there seems pretty fuzzy. No experts leading the charge or boundaries where information is obtained. It all seems rather chaotic to me. Not that I oppose changes in education or the unbinding of learning spaces. To answer Seimens' question to the class, i.e. "Is it fair to expect students to participant in space we create for them? ", I think the answer is yes and no, particularly at the undergraduate level because so many of the students I've encountered do not have a good foundation for learning. Part of the job of community colleges is to help the under-prepared figure out how to learn (and don't get me started again!). To set them loose in cyberspace without these skills is sinful, but modeling these skills, giving them time and reason to practice them, and encouraging them to continue must remain part of what we do. As students become more comfortable with learning, then, yes, they should be given much more control over their own learning and I see that is what Seimens has in mind. A part of me doesn't want to give up the comfortable feeling of working as an instructional designer at a bricks and mortar campus even though I design online "classrooms." I want to be assured I'll have a job in the next 5 years, I want to design learning in my own way and I probably will continue to do that for a while at least. However, I need to feel the slowing and lurching of this Titanic I'm on. I need to check around and see where others are going? Where are those escape hatches? Who is giving the directions? What will see travel look like once I'm off this thing? Bare rations, only the night sky for navigation, a lot of hopelessness as well as hopefulness, open waters, tiny boats, and lots of hands helping out. Sounds like chaos, but at least we haven't gone down with the ship! So, if the power and control in the connectivist classroom shifts from the instructor to the students, the question becomes "What is the role of the teacher in the connected classroom?" If the instructor is not at the podium in front of the room, where are they? If not the "sage on the stage", how does the instructor transform him or herself into the "guide by the side?" What the heck is a guide by the side, anyway? These are the questions the class touched on this week. Although there are some who sincerely believe teachers and academic institutions aren't necessary to support education, I'm not ready to advocate destroying the educational system as yet. If it were that easy, why isn't everyone living and working at graduate levels? Humans do need someone to show us how, to guide us through, but not necessarily to lecture at us. As was said during today's UStream session, the role of the teacher in the classroom is fragmenting and in a state of flux. It is changing at a rapid rate,and it's about time! I read an article (whose name and author escapes me at the moment) in which author pointed out that if we brought people from 200 years ago to modern times, most of them would not be able to function in their profession at all. For example, a farmer from the 1800's would be baffled by combines, fertilizers, and other modern farm implements. A doctor could not prescribe medicines nor perform surgery in a modern hospital. A lawyer would be sunk under the weight of law briefs that one has to know in order to practice law, but a college instructor, well, he could be plunked right down in the middle of the most progressive college and could still find his way around the halls of academia without much problem. Lecture halls still look pretty much the same, committees function in the same way, etc. Can we really say that the form of education serves us so well that we haven't needed to change it in hundreds of years? Of course not! So isn't it about time that education changes? Before we get to the finer points of change, I should point out the comments made as part of the discussion this morning that there have been times when education has made a change and it has hurt vast numbers of people. I'll give 2 examples from my own schooling. During my elementary school years, "new math" was introduced an we spent a huge amount of time dealing with set theory, alternate numbering systems, and other such concepts at the expense of basic arithmetic skills. As a result, I'm 47 years-old and still use my fingers to figure multiples of nine. In junior high school, we abandoned reading classics for newer, shorter novels or rather pieces of them. I haven't read many classics that I feel are so important to being a modern adult. Although I won't go on to actually name them as I'm too embarrassed, I am trying to compensate by reading some of them as an adult. The point is that making changes in education does have an effect on society as a whole, so we must consider it carefully. However, I don't think that releasing power and control in a classroom is all that detrimental as long as it transfers the power and control of learning to the students and doesn't dissipate it. It now becomes the instructor's job to toss the power out to the students and the students' responsibility to catch that power and control it. If the students refuse to accept the power over their own learning, the instructor has failed. Students today NEED to learn how to focus the control over their learning so that learning can continue after graduation. In the connected classroom, the instructor has a role quite different than the sage on the stage. He or she becomes the curator of learning artifacts, the facilitator of discussion, the community organizer, the product showcaser, and even the concierge of knowledge path: directing, questioning, pointing the way. But, I think the most important role of the connected-classroom instructor becomes that of evaluator. Especially in this day and age of accountability and assessment, it is the instructor who has to figure out who has got it and who does not. Who is on the path and who has wandered too far or not wandered far enough. However, it's not just a role for the end of the course. It's a role that instructors must take from day 1. What pieces does each student bring with him or her into the classroom? What pieces are necessary? What are the best tools to find and assimilate those pieces? Where are those pieces and how can I best direct students to find them? Do those pieces of content need to be created or re-created? These are the questions instructors must now answer. Instructor become full participants in the course, not just the drone reading from yellowed lecture notes and students also become full participants in the material - getting out of their seats perhaps (gasp! ), questioning, answering, and seeking their own way. So, the week started off with Stephen Downes auto-subscribing everyone to the Moodle forums which I had not participated in before. My reaction was a little surprising to me. I totally rebelled! Although I responded to Downes' post, I felt resentful that he made that decision for me to full up my mailbox and I reacted by tuning out this week. I did none of the reading and although I logged into the Wednesday session, I listened disinterestedly. I found reasons to miss this week's Friday wrap-up session as well. However, just because I haven't participated in the course itself, doesn't mean that I haven't thought about power and control this week. During the Wednesday session, the discussion turned to rubrics and since this is one thing I've been working on intensely these past weeks, it peaked my interest. I think it was Lisa Lane who indicated that she struggled with rubrics that didn't seem to pinpoint exactly what she wanted students to get out of the experience. Students seem to focus on whether they did more work than others in the group or whether they hit the number of words required, etc. It got me thinking about all the little boxes I was filling in as I created rubrics for our teacher education programs. How restrictive are these tools? Are they a help or a hindrance? Are they really getting at what we want out of the assignment or discussion and who is making the decisions about what is required? Doesn't a rubric create borders for an assignment that restrict a student's understanding of the material? Does a rubric which is supposed to give the student guidance on the requirements of the assignment give too much detail? Can it be so detailed that it restricts learning? The most general rubric we have in the EDU/EDS program is the Assignment rubric which has 2 criteria, content and technical. The exemplary content box of the rubric states that the assignment: Gives very specific information. Addressed all of the assignment components. Clearly illustrates critical and reflective thinking. Well thought out response. The poor response: Is vague and does not address all assignment components. No evidence of having given the assignment real thought. A more specific rubric is the Reflective Journal rubric which has 5 criteria: key ideas, application, philosophy, accuracy, and format. The criteria are much more defined in this rubric. For example, the exemplary key ideas criteria response displays: Key ideas specific to the subject are very, clearly stated, and well supported while the not acceptable response: does not identify key ideas OR entry is submitted late. In comparing these two rubrics, although the Reflective Journal rubric provides more definitive criteria, I think the Assignment Rubric allows the student more flexibility for interpreting and creating meaning within the assignment. The Assignment rubric ended up more general because it was created to grade multiple assignments of varying descriptions and types of activities from evaluating lesson plans to developing reading centers. To develop separate project criteria and rubrics for each of these would not only be time-consuming, but would take away from the creativity of students. One the other hand, the Reflective Journal rubric should probably be a little more defined. Many students today aren't used to journaling as may need more guidance as they reflect on what they have seen during their teaching experiences. However, we should be careful to monitor our preconceptions about this. It's a balancing act between providing students information about that for which they should be looking and shutting down pathways the student may want to explore. As an instructor, I would probably spend some time in the beginning helping students evaluate the rubrics and perhaps making some changes to help reflect their expectations as well. I believe that spreading around some of the power in a classroom, whether physical or virtual is a good thing for students. It helps them take control of their own learning which is own ultimate goal in the connected classroom. The second consideration of power and control this week came in the form of the book my daughter recommended, The End of America by Naomi Wolf. She outlines the 10 steps taken by fascist countries to shut down democracy and exert power over the people. I've gotten most of the way through the book and am appalled at the extent of the power that has been ripped from the American people. Although I knew there's been a huge power grab at the highest levels, the lose of control described by Wolf is scary. My only hope is that Mr. Obama has the guts to give it back to the Americans and put things right so that some despot can't come in and completely overwhelm us. Power corrupts, but absolute power corrupts absolutely. So returning to Mr. Downes' power grab this week, the point is taken that power and teaching have always gone hand in hand, but students do not benefit from being forced into little boxes whether they are rubric boxes or Moodle forums. Students should be empowered to explore, discover, create, and distribute their own learning. Wow! A lot to consider this week. This was the week to which I had looked forward because it addressed instructional design and now I'm not sure how or where to begin. Perhaps it would be best to consider my view of instructional design prior to this week's materials and then move on to what changes I now need to make. I've always seen instructional design, that's capital I, capital D, as the construction of a a path to learning. Most of the tools we currently use at Pima tend to reinforce that concept: the LMS (Blackboard), the chunking of materials into modules, even the introductory materials we give to our SME's emphasize a fairly straight and narrow path to design and to learning. This is not to say that I have ever believed in a formula strategy. I don't believe there is one path that if every student follows it, learning will necessarily occur, but we do treat the process of learning as, well, a process. One concept I've learned in my current position was developed by my esteemed colleague, Len Thurman. It is the concept of the three C's as we loving call it or Clarity, Consistency, and Community. All expectations, directions, rules, and materials must be clearly stated so that the student immediately understands what is expected. In other words, we try to keep a steady keel for students and not throw in some curve ball in the middle of the course by suddenly changing the way things are submitted or an expectation of the level of work (without warning). The course has consistency in navigation and in expectations. Student always know where to find this week's work and it has a predictable format. And finally, the student has a sense of being part of something larger than themselves, something in which they can contribute. Usually this takes the form of discussion questions, but is increasingly becoming group projects. We find that using the 3 C's helps our design process and has been very successful with many of our courses. Our post-baccalaureate teacher education program uses these concepts in all the courses and its graduates are 98% successful in passing the state requirements for teaching. In many ways, instructional design is necessary to assure growing public and legislative interests in the outcomes of education. "How do we know they know" is heard so often in the halls of academia, especially among institutions, like ours, that is in the midst of the re-accreditation process. North Central accreditation depends on assessment of student outcomes. Schools depend on their accreditation because they are literally not worthy of attendance without it. Additionally, those who finance education want to know the bang they get for their buck. so there are outside pressures on institutions to "prove" that learning occurs. This pressure trickles down to the classroom where teachers look for ways to prove themselves and their strategies in a world that is not particularly ripe for "knowing." "How do we know they know?" We often don't, but we have to find some way to let others be assured that something went on in the minds of the people that attended this class! And so Instructional Design comes to the rescue. Read this, view that, discuss this, turn in that, and then answer these questions and we will "know" what you know. Of course, it's not as simple as this, but when I look at courses not developed by instructional designers, I literally get sick. No discussion, no written assignments, just PowerPoints and multiple choice quizzes with lots of flashy, blinking graphics and clarifications all over the place. How does a student navigate THAT? It feels more about glitz than content. OK, so I've got this very invested and comfortable view of Instructional Design with all its little ducks lined up in a row, when along comes Connectivism and Connected Knowledge. How do I assimilate all this new material into my workings or do I need to chuck out everything and start anew? I'm back to the question of learning vs knowledge. Stephen Downes states that knowledge and learning consists of thousands of little pieces which we cannot possibly measure. There is no way to measure every single related bit of information a person possesses coming into the course and equally, we cannot measure and compare those pieces of information for each person at the conclusion of the course. So what do we look for? As instructors, we search for the underlying patterns that demonstrate knowledge. Using the dart throwing analogy that Downes suggested we ask, does the person consistently throw darts in the right direction or does the dart wander into the correct position by luck? A consistent pattern of throwing would indicate that the individual has some measure of underlying knowledge. Knowledge grows with learning and learning means that the knowledge connections are new or deeper or stronger...more complex in some way. We look for the patterns of response to change or grow. We look for the student to become more confident about their knowledge and be better able to cope with new situations or at least cope with the same situations in new ways. This process has to come from within, but there are external circumstances can enhance or hasten the process. And which processes are those? Well, that's the $64,000 question, right? If we can't know the pre-existing knowledge held in a student's brain (but we can guess), matching tools and information to the student's need is almost impossible. Providing a wide range of tools allows the student to create their own personal learning environment. But arrrrggghhhh! How can we possibly do this for all students and somehow point them in the right direction? At the beginning of the week, George Seimens proposed his view of id which includes 4 domains: Analysis & Validation, Ecology Design & Network Fostering, Adaptive Learning, and Review & Evaluation. Keeping in mind that throughout each domain are impacting factors such as context, readiness, resources, and time to name a few, the id process is the cyclical process of analysis, design, learning and review to which I am accustomed. However, one area that I began to see differently this week was what Seimens calls "ecology" of the course. I think what he means is the entire intertwined environment of the course taking into account the strengths and weaknesses of the students, the tools built into the course, the content and related materials, the desired outcomes, and the instructor's (and those others who hold stakes in the outcomes) expectations. Siemens maintains that by allowing greater flexibility in the outcomes we expect, we increase the chances of success. As someone wrote in the chat in Friday's session, this looks less like building a house and more like planting a garden. Yes, more like preparing the soil, providing the nutrients and water that the seeds need and then hoping that the seed sprout and take root. Building an architecture for learning may make us feel more like we are constructing learning, however, that's not how learning is really accomplished. 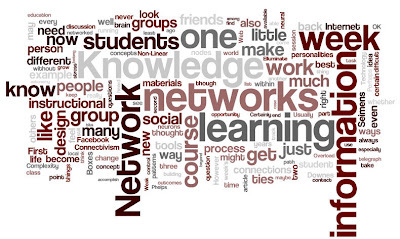 If knowledge is held within the connections and each person comes into the class with a different network of connections (neural, social, and conceptual), then learning occurs when we expand those networks and integrate nodes not previously established. As we design instruction, it is important to remember that we're not building a path or constructing a house as much as we are nurturing a garden. It is the designer and instructor's responsibility to weed out those tools and content that are misleading and irrelevant while nurturing the bits of learning actively taking place within the course. A couple of things jumped out at me while reading Complexity and Information: Overload in Society: Why increasing efficiency leads to decreasing control (Heylighen, 2002). First is the idea that as we reduce the friction between complex network connections, we increase the speed at which unanticipated or untended consequences occur. As the network grows, these consequences or side effects become increasing difficult to predict and control. This explains how a variety of problems, like red tape, seem worse than before we had modern mail and communication systems. The second thing that I reacted to in the article was the idea of opportunity overload which results from a decrease in friction in a network so that a person is offered many options that formerly were not available. For example, with the advent of the Internet, I can now receive job postings that meet certain criteria sent directly to my email in-box. These are opportunities that, a few years ago, I might never have known about. However, now I have to think about whether any of them might be worthy of some follow-up. Opportunity overload can result in confusion, stress and fear of not being able to take advantage of the "right" opportunities. So I was wondering about how this opportunity overload might affect students. If we "de-frictionize" the connections and offer a multitude of ways in which to learn, might students not become distressed over these options and feel stressed to explore every single one of them? I know I felt overwhelmed by the number of tools and information in this course and I am a very self-directed learner. Do we have a responsibility as educators to help students limit the opportunities available in a course so that they don't feel overwhelmed while still allowing them the options they need? Or is our responsibility to open up as many opportunities as possible for students? In the article, Developing Online from Simplicity toward Complexity: Going with the Flow of Non-Linear Learning (R. Phelps), Phelps outlines the conversion of a linear web-based computer skills course to a more non-linear format. I could particularly relate how Phelps described non-linear learning in the practical terms of learning to be a parent. Coming from an educational background, I've had a difficult time imagining what non-linear learning might look like, but this example was perfect! There is no one class that people take to become the "perfect parent". People may take different classes, read books, talk to others and so on, but many of us just experiment to see what works best. We're told this is a more natural form of learning and it's better for learners. The question is how to sell this idea to learners. My experience with non-instructor led, non-linear learning was just dismal. The students rebelled and literally demanded that I spoon-feed them the information - going all the way to the college president about my "horrible" teaching methods. Luckily for me, the president understood what I was trying to achieve and backed me up. In retrospect, I probably should have given them more rationale and maybe even tried to wean them off the spoon-feeding routine. It's hard for me to imagine students like these dealing positively with opportunity overload, but perhaps using an approach like Phelps' would help. Teachers also "teach in the way they were taught", but Phelps makes a compelling case for leaping off that moving train to benefit a new generation of students who are much more used to learning in non-linear fashions. I'm looking forward to next week's materials about instructional design and connectivism. Networks and groups and collectives, oh my! What's the difference? Is there a difference? How and when does each best function? These are some of the questions we explored this week (and yes, I DO feel more on track this week!). There are so many things in this course that I never really considered, but I feel as though I should have done so a long time ago, but alas, here I am. In this post, I'll try to briefly recapture some of what I managed to glean from this week's materials. The Seimens presentation focused on three critical elements of difference between groups and networks: individual autonomy, task specialization, and complexity. Differentiation between groups and networks can be defined as a function of these three aspects. Groups have less autonomy, greater task specialization, and complexity. Networks have more autonomy which results in a greater diversity of ideas. But don't rely on a network of people to get your task complete for there will be discussion and it may take a long while for action to occur. I had a random thought this week that perhaps that is why so many students struggle doing group work. Somewhere the autonomy, task specialization, and/or complexity is wrong for the expectations of the instructor or students. I now recognize that groups are much more structured than I would have supposed a week or so ago. They usually have a set start/end date and are restricted or defined by rules to accomplish some very specific task. The only example of a group I belong to right now is my running group, Women's Running 301. We've come together, paid a fee, and meet every Monday night for track work and every Saturday morning for a long run. Our goal is a 10 miler in December. Our coach, Alison, leads the group by organizing our activities. There's not always the teacher/ student relationship in a group, but there are usually defined roles for some, if not all, members. Groups use certain sets of tools to accomplish their goals whether that is a track or a certain type of software or some other thing. I really liked what either Terry Anderson or Stephen Downes (sorry I can't remember which) said in the Elluminate session this week about groups creating "same-ness." Everyone has the same group, the same tools, and the same direction. The end is the goal and we all work to get there. "If groups are managed, networks emerge" - another great quote from the Elluminate session this week. In thinking about which networks I am a part of, I came up with a much more impressive list than the groups I belong to. In addition to belonging to the running group, I also belong to a network of runners here in Tucson and also in Pennsylvania. This is different than our group in that it's much more loose. Each run may include different runners, but there is also a sharing of knowledge whether it's where the best prices for running skirts is or different stretching techniques. We share information among each other while sometimes filtering by interest - usually the guys don't get the running skirt information! Other networks of which I am part are those of birders, instructional designers, vegetarians, and community college employees. Some of those networks are national, for example, I keep in contact with several birders and vegetarians throughout the United States. We exchange stories, recipes and sightings. Other networks are more local. I'm very active in the instructional design network here at work, but don't really have too much contact outside of that. Networks can be differentiated from groups in that the members are more independent. There are few if any goals to accomplish and members generally float in and out of the flow of information. Members provide information for each to use as needed. Want a new recipe? Just click on the the recipe wiki we vegetarians started at work. Where is the local birding hotspot this week? Check out the listserv. The most important thing I learned about collectives this week is that people don't join them, but simply become part of them as a by-product of being part of a group or network. The best example of a collective to I belong is e-Bird. This is an electronic species listing software that tracks a birder's sightings (where and when). it keeps track of all your sightings and lists - the year list, the yard list, the life list, but it also aggregates the information input by thousands of birders to output all kinds of birding statistics so that if I wanted to see a certain bird on a certain date, the software could tell me where my best chances of finding it are. Certainly, groups have proven their effectiveness in academic settings, but what about networks? Do they have a place in education and if so, what is it? Given the fact that it is so much easier to network, it would seem to me that students should be given some exposure to networking in the classroom, but how? How could an instructor incorporate a network within a class? It seems to me that instructors need to start to reach beyond the limits of the semester and foster networking among students in a program, a university, a country, a career. Social learning software is doing just that, but some instructors are trying to force group "rules" onto a network.